Ian Richards is committed to breaking further new ground with Penistone Church next season, unless an Evo Stik club calls with an “offer that blows his mind”. Richards, one of the best young managers in the NCEL, has been linked with a number of jobs in the past two seasons because of his non-stop success with Penistone over the last eight years. The former Halifax Town midfielder and his brother Duncan have overseen Church’s incredible rise from the Sheffield & Hallamshire Senior League to the top six of the Premier Division, along with the memorable NCEL League Cup final triumph at Bramall Lane last year. Some say that Penistone have reached their glass ceiling, but Richards disagrees and believes his club can mount a bid for the next level. “You’re not the first person and you won’t be the last person to ask if I have taken the club as far as I can,” Richards told Non League Yorkshire. “For me to leave this football club, it has to be the right club at the right time. If an Evo Stik club did come calling, I would have to consider it. I went for an interview last summer somewhere. But there is only two, maybe three I would consider. “The club accept that. There were rumours when the Shaw Lane job came up again that they had come to speak to me. They hadn’t, but (Church secretary) Dave Hampshire asked me and told me that the club would not stand in my way. “I’ve always said that I want to move up the leagues with Penistone, but is this as far as we can go? The league is a tough one to get out of. But I’m planning for my tenth season with Penistone and doing better than this season. “I’ve sorted out four pre-season friendlies, I’ve spoken to the players about next season so I’m not going anywhere unless it is an offer that blows my mind. “As I have always said, I am ambitious, but I am ambitious for Penistone Church. I thought two years ago when we had Ollie Fearon, Danny Barlow and Steve Kenworthy and we got in the play-offs, that might have been as far as we can take it. “We went one better last year and you think ‘Premier Division, is this how far we can’? “I’m now talking ‘can we push for the Evo Stik’? We have done work on the ground near the dugouts and we could put a stand in to the right of the changing rooms if we need to. “We have the second best average attendance in the league so we have that behind us. “What we don’t want to do is put all our eggs in one basket in terms of having an unrealistic budget for the first team for one season and not sustain it beyond that. We would rather build from the juniors up. A top six finish is realistic for Penistone this season. Church have also broken further new ground by reaching the Sheffield & Hallamshire Senior Cup Final for the first time in their history. The League campaign did not start well, but since the end of September, Church have only lost four times in the Premier Division. Richards claims Church went back to the formula that won promotion last season. “We never thought we would get relegated, but we had to sort ourselves out,” he said. “We went back to what worked for us in Division One. We defended better as a unit and we were a little too attack-minded at the start of the season and it cost us a lot of goals. “We have built that consistency that we had in Division One. We have been defending and making it hard for teams to beat us. Because we have quality in our front three and the substitutes that can come on, along with Jordan Coduri in midfield, we are always going to score goals. “We have had a brilliant season. The Sheffield Senior Cup final is a major thing for this club because we have been in it for years, but never reached the final before. “Then in the league. Because of the run we have been on, we’re looking at finishing sixth. We’re going to try and sneak that sixth spot off Hemsworth if we can. “We are on a brilliant run. We are undefeated at home since September 23rd. We are almost undefeated against all the top sides. Penistone’s latest scalp came with the 1-0 win over title-chasing Pontefract Collieries on Saturday. Jordan Coduri got the winner as Church completed the double on Collieries and Richards hailed his players. 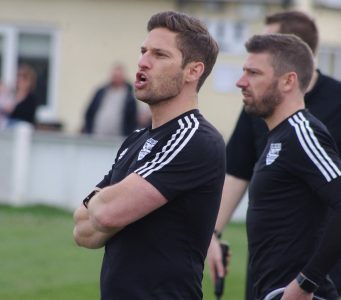 “To take six points off Pontefract Collieries and keep a clean sheet against a team that has scored over 100 goals in just over 30 games is an exceptional achievement,” he said. “They are still ahead of us and I think will still get promoted as league champions, but on head-to-head battles we have come out on top. “I thought the first half was fairly even today. We had the better football, but I thought they started the second half better than us. There was a bit of quality to the goal as it was an excellent through-ball from Ash Ellis to Jordan Coduri. “We then defended brilliantly towards the end. We won every header. Brett Lovell, Tom Brennan and Ryan Johnson won so many headers because they tried to overload on their right. “We lost our left-back James Young at 1.45pm to family reasons. Eight-teen year-old Freddie Russell came in and did well in the hardest game he’d ever played. “He went off when he tired and we put our captain Danny Howes there, but he went off with concussion. We had to put Tom Cadzow there and he’s been out 18 months.